Soft drinks, which originated as flavored and carbonated elixirs in the late 1800s and became especially popular during the Prohibition era, have long been associated with the region in which they were first developed. While some brands have branched out from their humble beginnings—Coca-Cola is sold in more than 200 countries and territories throughout the world—others have maintained a more localized appeal. Here are 11 lesser-known soft drinks and the stories behind their regional ties. When a sugar shortage at the start of World War I made it difficult for L.D. Peeler to sweeten his Salisbury, N.C.-based bottling company's popular Mint Cola, Peeler began looking for a less sweet, but equally tasty, alternative. The local businessman purchased a wild cherry flavor from a St. Louis salesman and developed the formula for Cheerwine in the basement of his grocery store in 1917. Cheerwine was an instant success and was outselling Mint Cola by the early 1920s. Shortly thereafter, Peeler changed the name of his business to the Cheerwine Bottling Co. The red-colored Carolina staple was distributed locally until 1981, when it expanded into Tennessee, Georgia, and Virginia. While Cheerwine's reach continues to grow, it remains most popular in the Carolinas and parts of Virginia. 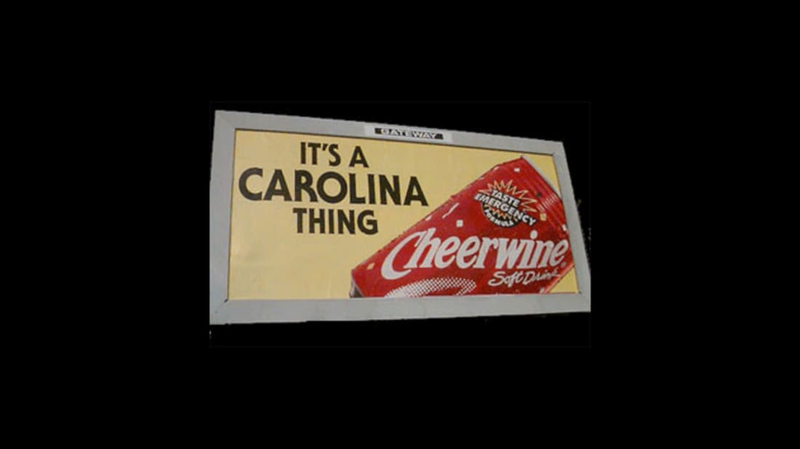 In 2010, Cheerwine partnered with a fellow Tar Heel State company, Krispy Kreme, to offer Cheerwine-infused doughnuts in stores throughout the Carolinas. It's no wonder Moxie tastes medicinal. The soft drink, which remains popular in New England, was invented by Dr. Augustin Thompson in 1884. Thompson, a Maine native and Civil War veteran who worked in Lowell, Mass., patented a nostrum called Moxie Nerve Food in 1876. Hoping to capitalize on the carbonated beverage craze at the time, Thompson reformulated his nostrum into Beverage Moxie Nerve Food, which was eventually shortened to Moxie, in 1884. Maine declared Moxie its state soft drink in 2005 and the beverage is celebrated with a festival in Lisbon Falls, Maine, every year. The word moxie, meaning the ability to face difficulty with spirit and courage, was derived from the soft drink. Today, Dr. Brown's is owned by Pepsi and available at various delis throughout the country. The brand's most loyal customers, many of whom find Cel-Ray the perfect foil to a pastrami sandwich, are in New York and South Florida. In 1937, Grover Thomsen and R.H. Roark developed Sun Tang Red Cream Soda while working as chemists at a barber and beauty supply company in Waco, Texas. According to Big Red, Inc., the Big Red nickname was coined by a couple of San Antonio golf caddies and officially adopted as the name of the drink in 1969. Big Red's line of beverages, which also include Big Blue, Big Peach, and Big Pineapple, has established itself as a big brand throughout the country, it remains especially popular in the southwest. Chicago's Schoenhofen Edelweiss Brewing Co. introduced Green River soda in 1919, just before the start of Prohibition. The lime-flavored and electric green-colored soft drink was initially bottled in the brewery's beer bottles and was an instant success. Al Jolson recorded a song about Green River in the 1920s, and by the end of Prohibition it trailed only Coke in fountain sales throughout the Midwest. The brewery made Green River a second priority when alcohol became legal again and sales of the soft drink dropped. While the brewery closed in 1950, Green River lived on. Today, Green River is bottled by Chicago's Clover Bottling Co., and while it remains most popular in the Windy City, it is now sold nationwide. Green River was part of the inspiration for Creedence Clearwater Revival's album and song by the same name and enjoys a major increase in sales in the weeks leading up to St. Patrick's Day. Belfast Sparkling Cider, which can be found in many Chinese restaurants in the Bay Area, dates back to the Gold Rush of 1849. According to soda expert John Nese, who owns and operates Galco's Old World Grocery in Los Angeles, gold prospectors, many of whom were sailors, would frequent San Francisco's bar scene in search of a good time. The sailors treated the bar girls to what they thought was imported French champagne, but which was actually Belfast Sparkling Cider, a lightly sweetened drink introduced to the region by Irish refugees who immigrated to the United States during the potato famine. It was a ploy by the ship captains, who apparently paid the bar girls to play along and watched their sailors become intoxicated to the point that it wasn't a struggle to get them back to sea. According to a 2006 article in the San Jose Mercury News, Belfast is distributed to almost every large Chinese restaurant in San Francisco and to retailers throughout the city's Chinatown. Belfast is especially popular in the month of the Chinese New Year. Kentucky-based soft drink bottler G.L. Wainscott developed the formula for his ginger-flavored Ale-8-One in the early 1920s after experimenting with different recipes while traveling in Northern Europe. The beverage's interesting logo is a pun on the winning entry in Wainscott's name-the-product contest, "A Late One. " The drink has been bottled in Winchester, Ky., since 1926 and distribution remains limited outside of the Bluegrass State. The Ale-8-One Bottling Co. introduced Diet Ale 8 in 2003. Since then, the company, which remains family-owned and operated, has introduced Ale-8-One salsa, BBQ sauce, and apple butter. Blenheim Ginger Ale traces its roots to the Blenheim Artesian Mineral Springs in South Carolina. It was there, in 1903, that Dr. C.R. May, a co-founder of the Blenheim Bottling Co., happened upon his recipe after adding Jamaican ginger to the foul-tasting mineral water he had advised his patients to drink. Today, Blenheim Ginger Ale, which is spicier than most soft drinks, comes in three flavors: Hot, Not as Hot, and Diet. The drink, which was sold for a time at Restoration Hardware stores throughout the country, boasts a bit of a cult following. The brand earned some rare publicity in 1994 when Penn Jillette wore a Blenheim T-shirt on a cover of Wired. In 1862, Detroit pharmacist James Vernor developed a mixture of 19 ingredients that included ginger, vanilla, and natural flavors. Before leaving to fight in the Civil War, Vernor stored his experimental mixture in an oak cask. When he returned four years later, he opened the cask to find it had transformed his blend of flavors into a delicious ginger ale. Vernor sold his concoction at his drugstore's soda fountain for the next 30 years. In 1896, with the help of his son, he began distributing his specially aged ginger ale in bottles. The Vernor family maintained ownership of the business until 1966. Vernors is distributed today as part of the Dr Pepper Snapple Group, with Michigan accounting for most of its sales. Like several of the soft drinks on this list, Hires Root Beer was developed by a pharmacist. According to one of the many stories behind the origin of America's oldest root beer, Philadelphia's Charles E. Hires discovered an herbal tea made of roots, berries, and herbs while on his honeymoon. Hires introduced a root beer mix that consumers could use to make their own root beer at the 1876 U.S. Centennial Exposition in Philadelphia—the same exposition where Alexander Graham Bell showcased his telephone. Hires developed a soda fountain syrup version of his root beer in 1884 and began bottling the drink in 1893. His decision to market the beverage as a beer rather than a tea, as he had originally considered doing, appealed to the Pennsylvania miners and added to Hires' popularity during Prohibition. Before there was Sprite, there was Sun Drop. Charles Lazier developed the citrus-flavored drink in St. Louis in 1928. The beverage was later marketed under several different names, including Sun Drop Golden Cola, Golden Girl Cola, and Golden Sun Drop Cola. The beverage became popular in the South, with bottling plants in Tennessee and North Carolina, and carried the slogan, "Refreshing as a cup of coffee. " Today, Sun Drop is owned by the Dr Pepper Snapple Group. This is by no means an exhaustive list. Share some of your favorite regional sodas in the comments. This post originally appeared in 2010.